Kevin Anthony working with Fairfield client Sherry Barringer in her dining. 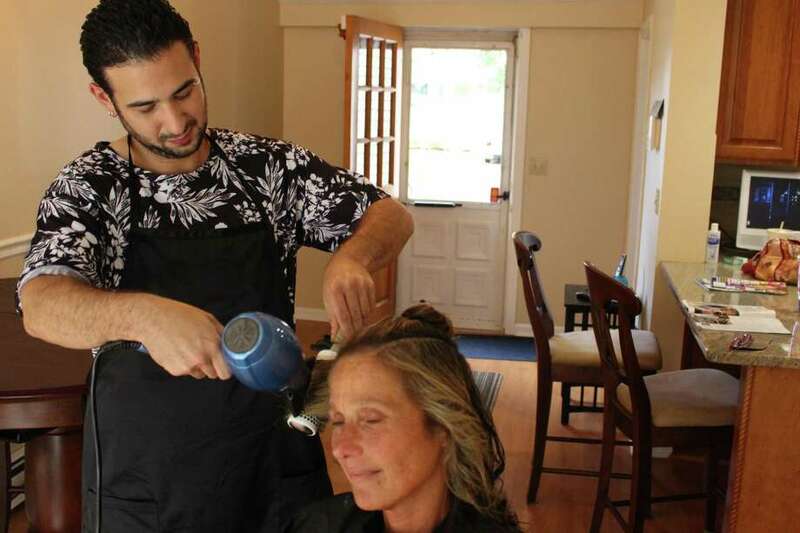 Bridgeport hair stylist Kevin Anthony is bringing the hair salon to his clients’ doorsteps with his traveling hairdressing business. With clients’ busy schedules and little room for routine appointment hindering clients, Anthony, a licensed barber and hair dresser, said he decided to take his skills on the road and provide the same services as a salon in someone’s home. “Whether you’re a busy mom or a bride to be and you simply just can’t make it to the salon, I bring my skills to people’s doors,” Anthony said. With the goal of making haircuts, dyes, and washes, among other things, more convenient and accessible, Anthony said his main demographic since starting his traveling business in January has been with mothers, brides and people with disabilities. After years of working in a salon and seeing the clients have to plan their schedules around a stylist and salon hours of operation, the Bridgeport resident said he wanted to center his services around the client and their schedules. “The schedule of a salon is really debilitating for someone who is busy or has a busy lifestyle,” he said. A common salon schedule of Monday through Saturday and 5 p.m. closing time doesn’t offer much wiggle room, especially with stylists who have other clients vying for their time. “It’s nice to be able to a give a client the option to not get dressed up to go to a salon; to sit in her pajamas and make the kids dinner while their hair is processing,” he said. He added that his services are prime for clients with conditions that would prevent them from traveling or being in a salon, even for kids like his nephew, who has autism. Several of Anthony’s clients also have severe anxiety and OCD, he said. As long as there is a chair and a power outlet Anthony said he offers everything a typical salon would, including shampooing and conditioning. He brings roughly a decade of experience to his craft. Though prices are subject to change with appointments that reach outside of a 10-mile radius from the Park City, Anthony travels throughout Fairfield County and as far north as Waterbury.